We’ve done several interviews with popular investors and fund managers over the past 12 months, but so far we’ve resisted the urge to look beyond the UK… until now. 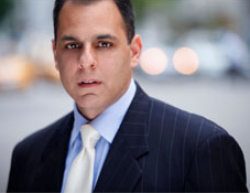 Mark Minervini is one of the biggest names in trading in the United States. He built his reputation with a stunning track record, and his approach has caught the eye of investors everywhere. He was interviewed in Jack Schwager’s excellent Stock Market Wizards and later wrote his own book, Trade Like a Stock Market Wizard. Mark’s strategy echoes a lot of what you find in small-cap, fast-growth strategies, and he uses a very refined set of criteria to find what he calls superperformers. For a start, he’s sceptical about traditional valuation metrics and much more interested in earnings growth and price momentum. He then marries his checklist of fundamentals with specific chart signals to find stocks that are breaking out - and then sells them before they break down. We’ll be doing the interview in the coming days, so if you’d like to ask any questions please feel free to add them in the comments below. Thanks! Good choice Ben! II understand his new book in coming out in March 17. Any info on what this will be covering - his first book was great but delving further into selling rules would be great. And how to add to winning trades. Good catch as an interviewee - a lot to be learned from him. I'd be interested if you could ask him something along the lines of:- "A lot of your early thinking was perceived as an evolution of Stan Weinstein's seminal work on "4 Stage Investing". Do you think this is accurate and if so what do you think are your primary similarities and differences from his approach". Hi - What is the title of his new book? Thanks guys! Great questions - I'm feeling the pressure with this one! Will be an thought provoking interview! Would be interested in hearing his views on how trading has evolved since he won the 1997 US Champonship and whether he thinks the "black box" algorithim driven large data set/super computer models have squeezed out the individual trader. Hi Ben. I have been following his approach for the past few months with mixed success. A quick review revealed that where I have gone wrong is not sticking closely to his guidelines, so a note to myself to be more disciplined. My question for Mark is this. A major plank of his approach is to pick stocks with strong earnings and sales growth. The trouble is that this filter rules out a lot of AIM stocks which pass all Minervini criteria bar these. And they go on to become super performers. Question: what is his advice in such circumstances ? Try his email book momentum masters for further delve into specifics. Not cheap but v interesting. Not sure if this interview has taken place yet. I have a question. Many people have read his book, attended his seminars and tried to emulate his success. Just a very few seem to have succeeded. What does he think makes just a small elite group achieve superperformance? Why do so many fail? Hi, thanks, it's a good question - really hoping to have the interview done soon (although there's always a chance of some unforeseen problem). I haven't achieved it myself but pretty sure the answer is your psychology and discipline + strict money management/ risk/reward. Like so many others he never lets a loss go more than 8% and work a risk reward ratio. He puts so much emphasis on this in his books. Same as any method, could be greatest method around but not going to work for you if you don't keep to the rules in good times and bad. the emphasis on protecting your capital, discipline and hard work is repeated by so many of the great traders. Ben, any update on the interview? For those of you who have burning questions, you can always tweet him on @markminervini . He is pretty good at replying fast ... ish. Also in passing, he has a new book due out in April of this year. That book is what's causing me all the trouble! But I think I've managed to pin him down now. Interview is scheduled for next week (add a little bit for clearance) - and it shouldn't be long.